Sponsorship Package information now available. The Standard ticket allows access to our world reknown whisky event. Standard donations include an invitation to our event, with dinner and dessert breaks built in, and our standard Glencairn glass. This year there will be the option for standard ticket holders to purchase cigar hour tickets, and have a chance to sit outside and enjoy outstanding Cigars, and amazing pairings. The Water of Life 2019 Standard Tier Ticket allows guests the opportunity to attend 9 dates, with at least 2 drams and food pairings available on each table. Master Classes and Cigar Hours may be purchased in addition. Master Class info to be released soon. The VIP ticket allows premium access at our world reknown whisky event. VIP donations include an early invitation to our event. Dinner and dessert breaks are again built in. Cigar lovers will have the option to spend an hour enjoying cigar pairings in our outside cigar lounge. 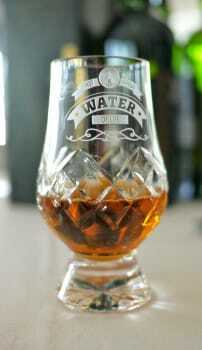 And of course you will be able to enjoy your exclusive pours in our VIP cut crystal Glencairn. Ticket price includes the donation to the charity and 1 raffle ticket. Water of Life 2019 VIP will be able to attend 13 speed dates, with at least 3 drams being offered on each VIP table. There is extra time allotted to our VIPs early in the event, and you remain a VIP all night, meaning you will have the same access to our amazing VIP pours at 10:30 that you have at 7 pm. Cigar Hour option included in price. Master Classes may be purchased, when announced. Cigar Hours, Raffle Tickets, and Master Classes the next night are all included in the ticket price. NEW for 2018 - Single and Loving It! This year Water of Life is pleased to announce its newest option, Single and Loving It! Guests who select this focus will be able to enjoy dates at tables where single cask pours will be available. In previous years guests have enjoyed these special pours from Independent Bottlers such as Blackadder, Douglas Laing's, Duncan Taylor, Five Lions, Gordon & Macphail, Signatory, Single Cask Nation, and SMWS, among others. Look for some new brands to join us, and who knows, perhaps some brands may again draw samples to be enjoyed just for the night of the show itself. ​Select this if you would like to guarantee a stop at mostly the American Whiskey Tables, to try a large assortment of Bourbons, Ryes and all sorts of American Whiskey. Please note you will still be able to learn about all types of Whisky from around the globe at the event, but by selecting this you will have a dedicated portion of your evening devoted to 'dating' our local spirits. ​Although many may feel that Manhattan is the world's greatest island, as a special treat at Water of Life 2018 you will be able to enjoy a more western version of Feis Ile. Select this option if you would like to guarantee you visit with ambassadors from Jura, Mull, Orkney, Skye, and every distillery in operation on Islay! A truly special journey on this special night. And no ferry pass required.